This post is part of the "Share a Story, Shape A Future 2012" Blog Tour. Check their site for many other fabulous posts! Life is difficult when you work with students who don’t like to read. How do you coax a dormant reader into full flower? Though that is hard, it can be just as tricky to wrangle voracious readers. Yes, they always have books in their hands, but how can I help them grow? That is my job. I am a gifted resource teacher, and my students range from first to fifth grade. Their reading levels can extend way beyond that, though, so meeting them all where they are can be tricky. The vast majority of my students are passionate about reading. Some aren’t, but most of them will gladly stick their nose in a book at the slightest provocation. What I’ve found over the years, though, is that they aren’t as willing to branch out and try new things. This year, I vowed, this year would be different. Before, students saw what other students were carrying around to read, but I never really dedicated time to talking about it. Before, I had shelves of books, all free for the borrowing, but I didn’t really push it. Before, I didn’t invest in a variety of graphic novels, nonfiction texts, and new releases to broaden their horizons. This year, though, this was the year it would change. 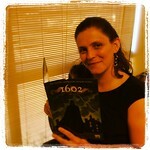 Dragon’s Book of the Week: I’m a self-proclaimed geek, and one of my geeky traits is a love of dragons. 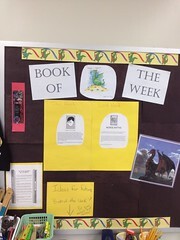 There are dragons everywhere in my room, and this year I decided to formally recommend a book every week to my students. My books have ranged across genres and topics, and I try to talk them up. 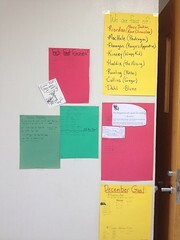 The bulletin board holds the selection for this week and last week, and the wall in the hall keeps all past recommendations in easy view. I’m also trying to get them all posted on a website so my teacher friends around the world can share my thoughts with their own students. Check out the link to see what I have! Effect: The students love this. Books that are displayed near that bulletin board are snapped up almost before I can finish putting up the description. The vast majority of them end up with wait lists, too. One of my fifth graders has even declared it his mission to read ALL of them this year. As a side effect, I can put a book on the shelf near the display, just casually, and it will also be grabbed. Reading Challenges: I’ve created mini reading challenges for the students. They can choose whichever ones they want; none are required. These challenges include things like “Mythology Multipass” and “Poetry Authority”. This is my big push to help them step out of their comfort zones. We set monthly goals, and celebrate our progress. Yes, I participate in the challenges, too. They love that. Effect: I’ve seen more students trying new things this year. Whenever I add a new challenge opportunity to the list, those books fly off my shelves. Cool, right? Sharing my reading goals and progress: I participate in the same reading challenges I give the students. They love it, and it gives me wonderful recommendations for them. I have posted my progress on my Newbery Challenge (#nerdbery) and my progress toward my overall book goal for the year. Effect: My students eagerly examine my progress wall. They try to “beat the Dragoness” in the challenges. 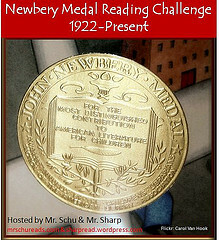 One student has even decided to try out a book or two from each decade of the Newbery Awards. Effect: Since my enthusiasm for new books is so high, it’s infectious. You know, I don’t think I truly realized how much I’ve done this year to help my dragonlings spread their wings. Sometimes it takes sitting down, writing, and sharing with other teachers to give you a chance to reflect on your own successes. Looking around my classroom, though, and watching kids talk about books and grab for a new one – that’s really what it’s all about.